XSYTE Sports Websites - Tired of making sure people are coming to the game? Any hockey league organizer will know the headache of making sure players can make games and setting up substitutes when a player is not available. 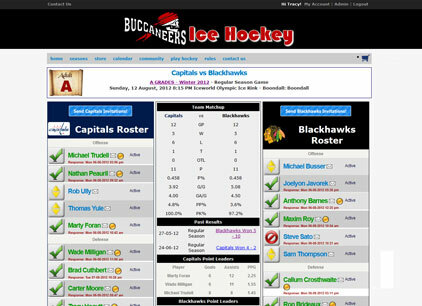 HockeySYTE uses email and SMS to send out game notifications to players. As the responses come in the rosters are updated in real time. When a player is not available, your substitute is invited to the game. This saves a lot of hassle for the organizer, makes sure there are enough players for the team and ensures enough money-paying people are showing up week in and week out. This system also works fabulously for pickup/shinny sessions. Get great pickup games each time with just the right amount of players.